This is an easy project kids can do by themselves or with very little help, and these fs make a great Mother's Day present. Make a bunch for a lovely Spring bouquet! Cut the egg carton into separate cups, leaving some of the middle "pop-up" sections. Cut the main cups into the pointed shape of the tulip petals. With the point of the scissors or a sharp pencil, poke a hole in the bottom of each cup. Paint and decorate each cup however you like. Cut the little center "pop-up" sections between the egg cups into small pointed shapes that will go beneath the tulip cups. Poke a hole in the center of each and paint green. When the pieces are dry, poke a piece of green chenille through the holes. Tie a loop on the end in the cup so it can't pull back out, and add a dab of glue between the two sections. 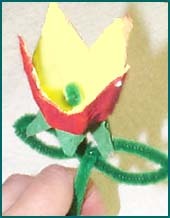 Shape the chenille into leaf shapes and leave a few inches at the bottom for the stem. You can stick the stems of several fs into some clay or floral foam in the bottom of a pot. Or just tie together and wrap with pretty paper and a ribbon to give to mom!